A thoroughly enjoyable movie with real ships and lots of original wartime footage, which make it a refreshing change from some of the slick but unconvincing modern offerings. More than a few of the usual, expected stereotypes are depicted, but the plot chunters along at a cracking pace, interspersing furious naval action with some well-observed ‘stiff upper lip’ screenplay, some nerve-wracking espionage work and any number of amusing little character studies. Honour, death, determination, courage, childbirth, duplicity, fear and humour are dealt with in turn and all acted out in a thoroughly workmanlike manner. 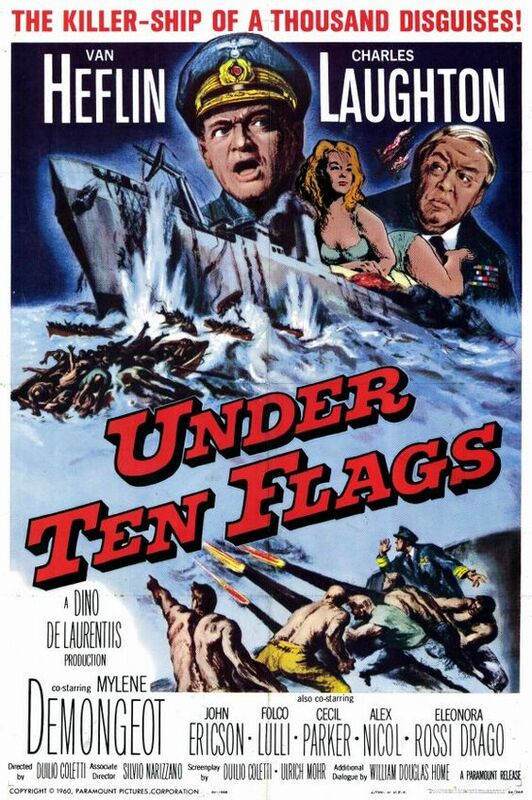 Van Heflin is superb as the captain of the German ship and the unutterably delectable Mylene Demongeot is stunning as a perky nymphette who, obviously fearing her looks would fade before the end of the film, seemed desperate to hook a guy (any guy) before the end credits! As might be expected, the entirely dependable Charles Laughton did a sterling job of playing Charles Laughton – in a Sailor Suit! Without exception the rest of the supporting cast were top notch – all the way down to the brave little kids being winched aboard ship in a cargo net!! As it is based on true events, this movie is all the more worth watching by anyone who enjoys naval warfare stories and is heartily recommended!